Total minted of proof coins were 108,000 pieces. These legal tender coins have been struck to proof quality using specially prepared dies and highly polished blanks. The United Kingdom coinage is kept under constant review. By 1980 it had become apparent that with the general decline in purchasing power, the £1 unit of currency was more appropriate to a coin than a banknote. The note was in constant use on average lasting only nine months, whereas a coin can last as long as forty years or more and with the growth in the vending industry it was felt that a coin would be more useful. 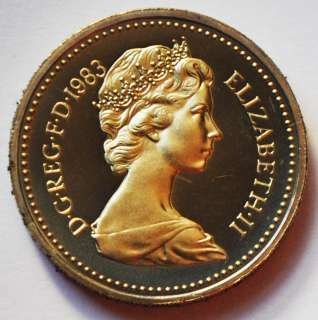 After consultation with many groups including retailers and special interest groups, the Government announced on 31 July 1981 that a new £1 coin that was to be issued on 21 April 1983. 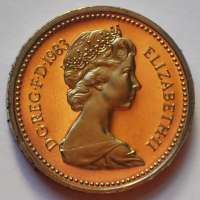 The coin was introduced on 21 April 1983 to replace the Bank of England one pound note, which ceased to be issued at the end of 1984 and was removed from circulation (though still redeemable at the Bank's offices, like all British coins and banknotes) on 11 March 1988. 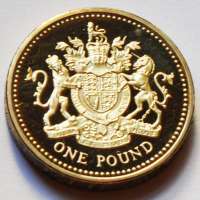 To make it easy to identify, the £1 coin is thicker than other coins while the 'yellow' colour allowed it to stand out from the cupro-nickel 'silver' coins already in circulation. The weight of the coin was decided largely on the grounds of cost and the need to allow for higher denomination coins in due course. 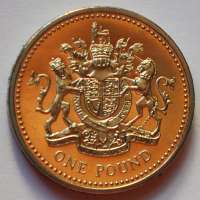 The £1 coin has the standard obverse designs used on all contemporary British coins, namely the effigy of Queen Elizabeth II byArnold Machin in 1983 and 1984, by Raphael Maklouf from 1985 through 1997, and by Ian Rank-Broadley from 1998 onwards. All have had the inscription ELIZABETH•II D•G•REG•F•D . Unique among modern British coinage, the £1 coin (except for 2004-2007 and the 2010-2011 'capital cities' designs) has a mint mark: a small crosslet found on the milled edge that represents Llantrisant in South Wales, where the Royal Mint has been based since 1968. In 1983 a total of 443,053,510 were minted for public circulation. Edge inscription: DECUS ET TUTAMEN ("An ornament and a safeguard" – originally on 17th century coins, this refers to the inscribed edge as a protection against the clipping of precious metal. The original appearance of the phrase is attributed to an epic poem by Virgil — "viro decus et tutamen in armis" (Aeneid, Book V, L. 262), describing a piece of armour, a breast-plate interwoven with gold, which was awarded as a prize to Mnestheus.) Designed by Eric Sewell. DECUS ET TUTAMEN is the motto of a British Army cavalry regiment, later artillery - The Essex Yeomanry, established in 1794. The motto was confirmed by King Edward VII in 1909 when it was added to a regimental guidon (or colours) presented to the Essex Yeomanry regiment by the King. The definitions are: "decus" - virtue, honour or glory; and "tutamen" - defence or protection, thus the meaning is said to be "honour and defence". Jaka jest wartość tych monet. Good day i have a 1983 "one pound" sterling ELIZABETH.11 D.C.REG.F.D and DECUS ET TUTAMEN inscribed on the edge what would the value be of this coin. Wow... i have found 1 pound coin of 1983 from the local market, please tell me the exact value of this coin. Hi! 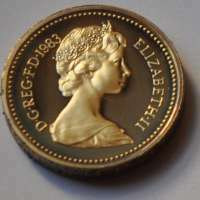 I do have exactly Great Britain 1983 1 pound Royal proof coin Elizabeth 11 D.G.REG.F.D 1983 and in the edge says DECUS ET TUTAMEN +. I want to know how much is it ? I believe this is the real minted 443,053,510 for public circulation and it very thick coins.also at the edge proof is exactly what it says that based on 17th century coins. Please let me know the exact value. Thanks a lot. I have a D.G.REG.PF.D.1O83. ELIZABETH.ll. POUND DECUS ET TUTAMEN AND I WOULD LIKE TO KNOW HOW MUCH THEY ARE WORTH IN THE STATE OF TEXAS, UNITED STATES? Coin ... so plzzz rare coin velue & send indian rupee of this coin..
how much value this coin has now in india. How many can i get if i re-sell it in malaysia? Is there any value to this coin?